There’s no better time to be in God’s own country. Take in the fragrances and flavours, enjoy the sights and sounds of celebration as an entire world of festivities opens up to embrace you during Onam Festival in Kerala. Onam is the most popular among festival in Kerala and falls during the Malayali month of Chingam (Aug – Sep). Celebrations of Onam marks the homecoming of legendary King Mahabali.. Onam is the most popular harvest festival among all the festivals in Kerala where celebrations include Onam Sadhya, Pookalam , Pulikali and songs that welcomes King Mahabali. Onam brings out the best of Kerala culture and tradition and lasts for ten days. Intricately decorated Pookalam, ambrosial Onasadya, breathtaking Snake Boat Race and exotic Kaikottikali dance are some of the most remarkable features of Onam – the harvest festival in Kerala. The legend of Emperor Mahabali is the most popular and the most fascinating of all legends behind Onam and Onam is celebrated to welcome the visit of Emperor Mahabali to the state of Kerala every year. The festival is celebrated with fervour as Emperor Mahabali is greatly respected by his subjects. Emperor Mahabali is also popularly called Maveli and Onathappan. Mahabali was the Asura emperor who once ruled Kerala and was loved by the people in his kingdom as he was sensible, careful and incredibly nice. It is said that Kerala experienced a golden era under Emperor Mahabali where everyone was satisfied and happy in the kingdom and everyone was equally treated without any discrimination whether they were rich, poor or belonged to any caste. There was neither corruption nor crime and the people in Mahabalis reign did not even secure their gates, as there were no criminals in that kingdom. There was no hardship, sadness or illness in the rule of Emperor Mahabali and everybody was happy, satisfied and content. It may be noted Mahabali was the son of Veerochana and grandson of Prahlad, the devout son of demon King Hiranyakashyap. Mahabali had a son called Bana, who became a legendary king in his own right and became popular as Banraj in central Assam. Mahabali belonged to the Asura (Demon) dynasty but was an ardent worshiper of Lord Vishnu. His bravery and strength of character earned him the title of “Mahabali Chakravathy” or Mahabali – the King of Kings. Looking at the growing popularity and fame of Emperor Mahabali Gods became extremely concerned and jealous. They felt threatened about their own supremacy and began to think of a strategy to get rid of the dilemma.To curb the growing reign of Mahabali and maintain their own supremacy, Aditi, the mother of Gods sought the help of Lord Vishnu (the preserver in the Hindu trinity) whom Mahabali worshiped. It was said Mahabali was very generous and charitable. Whenever anybody approached him for help or requested for anything he always granted. To test the Emperor, Lord Vishnu disguised himself as a dwarf and poor Brahmin called Vamana. He came to the capital of Mahabali, just after Mahabali performed his morning prayers and was preparing to grant boons to Brahmins. Disguised as Vamana, Vishnu said he was a poor Brahmin and asked for a piece of land. The generous Emperor said, he could have as much land as he wanted. The Brahmin said that he just wanted as much land as could be covered by his three steps. The King was surprised to hear but agreed.A learned adviser of the Emperor, Shukracharya sensed that Vamana was not an ordinary person and warned the King against making the promise. But, the generous Emperor replied that it would be a sin for a him to back on his words and asked the Brahmin to take the land. The Emperor could not imagine that the dwarf Brahmin was Lord Vishnu himself. Just as Emperor Mahabali agreed to grant the land, Vamana began to expand and eventually increased himself to the size of cosmic proportions. With his first step the Brahmin boy covered the whole of earth and with the other step he covered the whole of the skies. He then asked Emperor Mahabali where is the space for him to put his third foot. The Emperor realized that he was no ordinary Brahmin and his third step will destroy the earth. Mahabali with folded hands bowed before Vamana and asked him to place his last step on his head so that he could keep the promise. The Brahmin placed his foot on the head of the Emperor, which pushed him to patala, the nether world. There the Emperor requested the Brahmin to reveal his true identity. Lord Vishnu then appeared before the King in his person. The Lord told the Emperor that he came to test him and the Emperor won the test. Emperor Mahabali was pleased to see his lord. Lord Vishnu also granted a boon to the Emperor. The Emperor was so much attached with his empire and people that he requested that he be allowed to visit Kerala once in a year. Lord Vishnu was moved by the Emperor’s nobility and was pleased to grant the wish. He also blessed the emperor and said even after losing all his worldly possessions, the emperor would always be loved by Lord Vishnu and his people. The day of the visit of Emperor Mahabali to Kerala that is celebrated as Onam every year. The festival is celebrated as a tribute to the sacrifice of Emperor Mahabali. Every year people make elaborate preparations to welcome their emperor whom they affectionately call Onathappan. They wish to please the spirit of their emperor by depicting that his people are happy and wish him well. The second day, Thiruvonam is the biggest and the most important day of this festival. It is believed that Emperor Mahabali visits his people on the second day. Onam celebrations are marked in Thrikkakara, a place 10 km from Kochi (Cochin) on the Edapally- Pookattupadi road. Thrikkara is said to be the capital of the mighty Emperor Mahabali. A temple with a deity of ‘Thrikkakara Appan’ or ‘Vamanamurthy’ who is Lord Vishnu himself in disguise is also located at this place. Nowhere else in Kerala can one find a deity of ‘Vamanamurthy’. This fascinating legend is artistically depicted at the Suchindram Temple in Kanyakumari district of Tamil Nadu. Onam is celebrated on the first month of Malayalam Calendar (Kollavarsham) in the beginning of the month of Chingam . 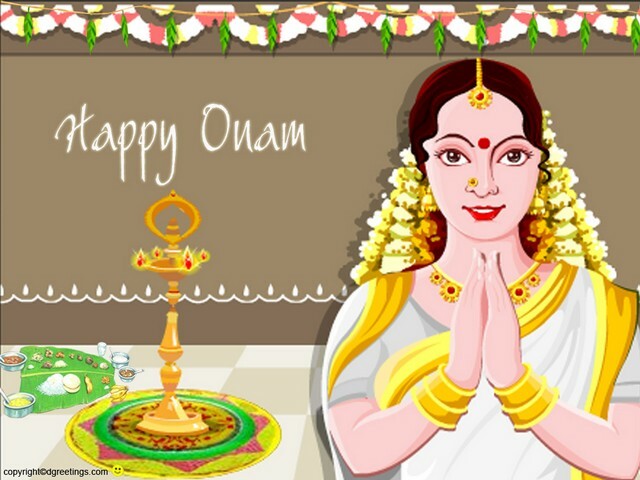 Festivities of Onam commence approximately 10 days before Thiru Onam on Atham and Onam in 2014 willbe on September 7. One of the first memories that come to mind when thinking about Onam & the legend on mahabali is that of the flower bed or floral arrangements known as Pookkalam or Athapookkalam. The traditional Ona-pookkalam usually consists of ten rings indicating the ten day ritual during the ten day celebrations of Onam which begins on Atham and ends on Thiru Onam in the month of Chingam. Onam Pookkalam is considered as a symbol for secularism. Various kinds of flowers combine together to form a great-looking pookkalam and the size of the Pookkalam grows from Atham to Thiruvonam to reflect those old good days during King Mahabali. 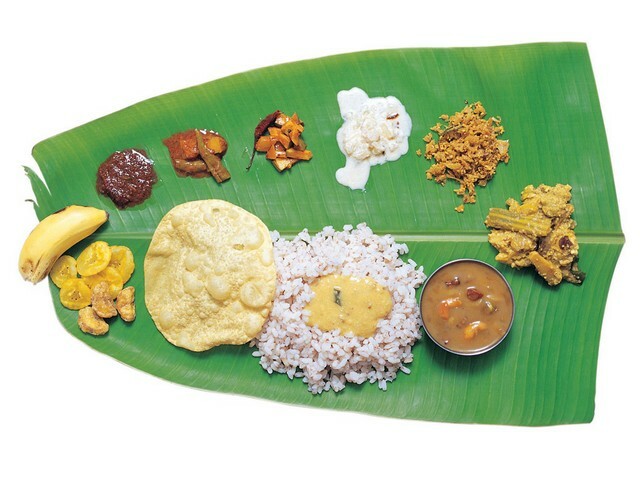 Onasadhya is supposed to be the grandest Kerala traditional meal that is served on a banana leaf and is enjoyed on the last day of Onam, known as Thiruonam. Onasadhya is a symobol of the prosperity that was existing at the time of rule of Mahabali and the people of Kerala ensures that Mahabali sees them with the grandest meal on the auspicious day or Thiruvonam.Rich and the poor across all regions and religions in Kerala makes grand Onasadyas . Onasadhya is savoured in a specific order on a banana leaf with Pappad or Pappadumon the extreme left.Sarkaravaratti , banana wafers, salt and fries are served from the right of pappadam which is followed by ginger lime and mango pickles . Vegetarian delicacies like pavakka and ‘ullikitchadi’ made of onions and ‘Kitchadi’ made of pineapple and banana splits and ‘thoran’ whihc is a mix of vegetarian curries is served after this assortment. The meal will be complete with the payasam which is the dessert. Pulikali also known as Kaduvakali is a colorful recreational folk art which is performed by trained artists to entertain people on the occasion of Onam, an annual harvest festival where artistes dance wildly and mimic hunting moves to the beat of drums. Puli Means “leopard” and Kali means “Play”. On the fourth day of Onam celebrations (Nalaam Onam), performers painted like tigers and hunters in bright yellow, red, and black dance to the beats of instruments like Udukku and Thakil. Literal meaning of Pulikali is the ‘play of the tigers’ hence the performance revolve around the theme of tiger hunting. The folk art is mainly practiced in Thrissur district of Kerala. Best place to watch the show is at Swaraj Round, Thrissur on the fourth day of Onam, where Pulikali troupes from all over the district assemble to display their skills. The festival attracts thousands of people to the Thrissur city. Another famous regional celebration during Onam time is Snake Boat Races in Kerala including Aranmula Snake Boat Race which is held during Onam in Aranmula Parthasarathy Temple . Onam which is celebrated every year in August or September is the best time to visit Kerala and you can enjoy Kerala in its full splendor during the Onam time along with savoring an Onasadhya, participating in making a Pookalam at a resort and enjoying the scenes in Kerala during Onam Festival.